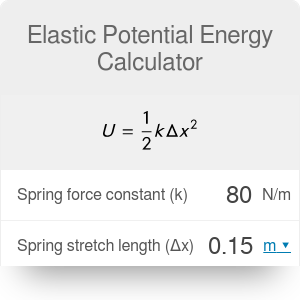 This elastic potential energy calculator makes it easy to determine the potential energy of a spring when stretched or compressed. Read on to get a better understanding of this concept, including an elastic potential energy definition and an example of calculations. Make sure to check out our gravitational potential energy calculator, too! Imagine a simple helical spring. You can compress or stretch it (to some extent, of course). To do it, though, you need to perform some work - or, in other words, to provide it with some energy. This energy is then stored in the spring and released when it comes back to its equilibrium state (the initial shape and length). Why exactly is this called 'potential energy'? You can think of it like this: the spring doesn't spend the energy at once (in contrary to kinetic energy), but has the potential to do so. k is the spring constant. It is a proportionality constant that describes the relationship between the strain (deformation) in the spring and the force that causes it. Its value is always real and positive. The units are Newtons per meter. x is the deformation (stretch or compression) of the spring, expressed in meters. U is the elastic potential energy in Joules. Try the Hooke's law calculator if you want to calculate the force in the spring as well. Follow these steps to find its value in no time! Determine the spring constant k. We can assume a spring of k = 80 N/m. Decide how far you want to stretch or compress your spring. Let's say that we compress it by x= 0.15 m. Note that the initial length of the spring is not important here. Substitute these values to the spring potential energy formula: U = 0.5 * k * x^2. Calculate the energy. In our example it will be equal to U = 0.5 * 80 * 0.15^2 = 0.9 J.
Elastic Potential Energy Calculator can be embedded on your website to enrich the content you wrote and make it easier for your visitors to understand your message.